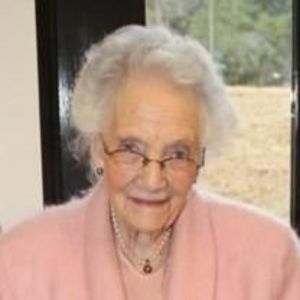 Wilson -- Marjorie Maude “Ding” Campbell, age 92, died Sunday 12/24/17 at Wilson Memorial Hospital. She is survived by her three children, Heather Scott, of York, South Carolina; Christopher Campbell of Tallahassee, Florida and Cleo Robbins of Chadds Ford, Penn; seven grandchildren and four great-grandchildren. Born 12/7/1925 in Port of Spain, Trinidad, West Indies. Her family was early settlers of Trinidad & Tobago. It was in Trinidad where she met her devoted husband, John Campbell, of London, England, where he was a Professor at the Imperial College of Tropical Agriculture. Together they travelled to all corners of the world throughout their 52 years together. Ultimately, those travels brought them to Wilson NC where the community welcomed her and her family. Mrs. Campbell leaves a legacy of service to her church and the community as well as being on the forefront of meeting citizen needs. Beginning during the Second World War, she was an instructor in aircraft recognition and nursing aid for the Red Cross in Trinidad. Here in Wilson, her services included: Founding Member and “Dead Header” at the Wilson Rose Garden; Chairperson of the St. Timothy’s Soup Kitchen; Co-Founder of Wilson Men’s Shelter; Active Member of the Wilson Red Cross; Volunteer at Wilson Memorial Hospital, Chairman Hope Station; Board Member of the Wilson Appearance Commission; Chairperson of the Wilson Blood Mobile; and knitting hundreds of wraps over 25 years for the Wesley Shelter for Battered Women. Through those services and more, her contributions enhanced the lives of so many. The funeral service will be held at St. Timothy’s Episcopal Church, Wilson at 11:00 am on Friday 12/29/17, by Rev. Marty Stebbins. Immediately following the service, the family will receive friends at the church. In lieu of flowers the family requests memorials be made to the College of Agriculture & Life Sciences at NC State University, Campus Box 7642, Raleigh, NC 27695-7642. Call (919) 515-2000 for the John S. Campbell AG END (Scholarship).